Both trainee and senior GPs prescribed antibiotics without clinical need when faced with a virtual reality (VR) scenario where patients angrily demanded them, finds new UCL research. The study, authored by an interdisciplinary team from UCL Laws, UCL Institute of Cognitive Neuroscience, UCL Computer Science and ICREA-University of Barcelona, is published today in PLOS One. It highlights how VR could be of significant use in the education and training of GPs and other professionals who encounter ethical dilemmas. 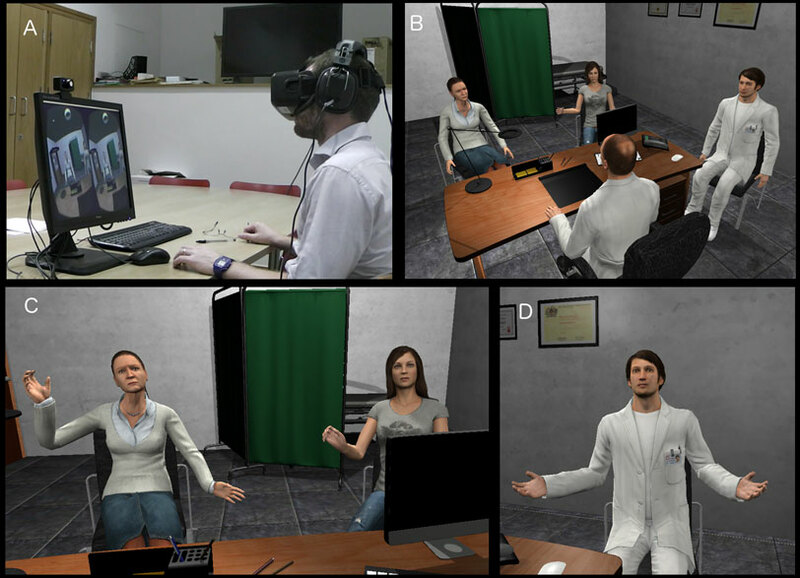 The scenario, which used the Oculus Rift VR system, placed both trainee and more senior GPs into a virtual consulting room with virtual patients voiced by actors. The scenario involved a daughter pushing for the prescription of antibiotics for her mother (in her 60s) who has a sore throat and cough. The medical signs are that this is a virus, however when the GP participating suggests treatment such as rest and paracetamol, the daughter becomes increasingly angry, accusing the doctor of not prescribing the antibiotics because of NHS cuts, and because old people are invisible and no one cares about them. 8 of the 9 trainees who participated in the study prescribed the antibiotics, compared to 7 out of 12 more senior GPs. The study, although involving a small number of people, demonstrates that GPs of different levels of experience find such situations difficult - as well as showing the potential value of VR scenarios in professional education and training. Lead author Dr Sylvie Delacroix (UCL Laws) said: "It is well known that antibiotics are massively over-prescribed and that this contributes to the rise of antibiotic-resistant infections. What should the GP do when faced with a situation like this - prescribe the antibiotics to minimise stress and increase the patient's likely satisfaction? Refuse the prescription (even if this might jeopardise the long-term relationship with the patient) and live with the risk of potential complications? "The first time doctors will encounter such a choice is when they are faced with it. No amount of textbook learning or advice from seniors can substitute for experience. We wanted to see how VR could be used to help understand how GPs respond to this dilemma, as well as whether there might be a difference in response between more senior doctors and recent trainees." Co-author Professor Mel Slater (ICREA-University of Barcelona and UCL Computer Science) added: "More than 25 years of research in virtual reality have shown that people tend to respond realistically to virtual events and situations. This study was no exception and in was interesting to see the degree of stress exhibited by the participants in the course of this confrontation - even though the characters and the situation were entirely virtual, it felt real. "The idea that professionals can experience such dilemmas in virtual reality before ever confronting them in reality can be compared to a pilot first training on a simulator. Our results suggest that such VR scenarios could be of significant use in the education and training of GPs - and potentially more widely, as many professions face these kind of complex ethical situations."